Thinking of travelling to Jerusalem? These are a few places you need to visit while there. Also known as the Holy City, this old place has a lot to show in terms of history, for people who are looking for something spiritual and also cultural. The city sits high in the Judean Hills overlooking the Judean Basin, on the edge of the desert so summer days are hot but not humid and at night the temperature drops. The winters, which occur between October and April, are cool and wet. It sometimes snows, so if you are planning to visit around that time do not forget to pack a coat or two. Jerusalem is divided up in districts and a lot of them have something to show. 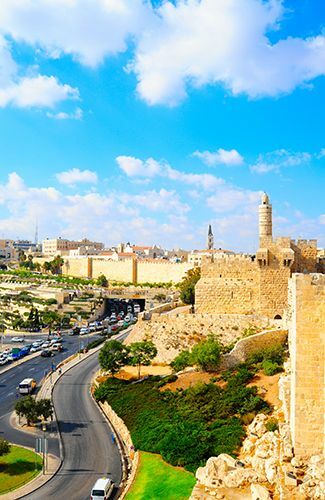 It is the walled area of Jerusalem and is a UNESCO World Heritage Site. This breathtaking, ancient city is home to holy sites such as the Western Wall and Temple Mount for Jews, the Dome of the Rock and al-Aqsa Mosque for Muslims, and the Church of the Holy Sepulchre for Christians. Kindly note that if you plan to visit these sites, it is advisable to dress modestly as a sign of humility to the local population and their beliefs. Since 1892, the time Jaffa-Jerusalem Railway was being created, this modern commercial center has been the focus of development. It is also known as New Jerusalem. This district has several notable neighbourhoods. Me’a Shearim is a 19th century Russian town-looking neighbourhood with largely Yiddish speaking inhabitants. It is largely home to ultra-Orthodox Jews so modest dressing is required. The German Colony is the best place to dine. Ein Kerem maintains its village atmosphere. Surrounded by beautiful hills covered with olive and cypress trees, is not a wonder why artists and sculptors have made a home here. It also believed to be John the Baptist’s birthplace and several churches are built on that site. Jerusalem is also a haven for archaeologists. Most of the archaeological findings here prove the existence of Jerusalem as far back as 4th millennium BCE. The Amarna letters are the earliest written records of the city dating back to 14th century BCE, along with the Execration Texts of 19th BCE. The main languages spoken in Jerusalem are Hebrew in the Western parts and Arabic in the eastern parts of Jerusalem. Do not fret that you will not be able to communicate; most people speak enough English to help you get what you want and where you want. After a visit through some of these sites, it is good to keep lasting memories. What better way to store these memories than with a camera? In the fast-paced world we live in today, and with Photoshop being a mainstay, your friends and colleagues may not believe you ever went there so what better way to prove it to them than will live chats and Skype? before travelling, you can order an Israeli SIM card online and collect it at the airport upon arrival. This will not only help you share your memories online but also help you communicate with family back home and assure them of your safety.